There are times in which you won’t be using your RV or trailer for a long time. Of course, there are very few garages that exist that are big enough to house an RV. If unprotected, your trailer can get exposed to rain, wind damage, dirt, sunlight and other elements of nature. All of these can damage the coat of paint on your RV as well as cause surface scratches to develop over time. To prevent this from happening, consider getting an RV cover so that your vehicle remains in pristine condition. 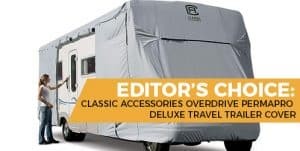 In this review, we will be taking a look at five great RV covers from brands such as Camco, Adco and Classic Accessories. Each cover has its share of strengths and well as weaknesses, and you should read on to find out about which cover is the best for your money. Allows you to enter and exit your RV. Weighted bags for easy installation. Cinching system for easy installation. Keeps RV from getting too cold. This first RV cover comes from Classic Accessories. It is made for RVs and trailers that are 124 inches high and 38 to 40 feet long. This light grey RV cover is made out of what is known as “ripstop fabric”. This durable fabric won’t succumb to virtually anything from dust storms to debris from high winds. The elastic hem corners made the cover fit around the RV like a glove, so it is very hard for the cover to come undone unless you take it off intentionally. Included with this RV cover is a storage bag. When your cover is not in use, it can be put inside this portable and easy-to-carry bag that is the same color as the cover itself. The zippered access panels are designed to allow anyone to get inside the RV while it is still covered. This allows you to retrieve belongings or do some spring cleaning without having to remove the cover, which is incredibly useful. This RV cover comes with a lifetime warranty. Any flaws or defects from the manufacturer or shipping can be addressed without you having to waste any more time or money. The weighted toss bag system also eliminated all the dirty work that comes from tethering the RV cover to the RV. This means to needing to crawl under the RV to strap the cover, which is more than nice. The description of the RV cover is deceiving in the sense that it ends up being too big for your RV. If the cover is too big, it won’t fit well, and it may not stay on your RV. What we recommend for you is to purchase the size that is below this one for a better, more suitable fit. This next RV cover is brought to us by Leader Accessories. It fits RVs spanning from 27 to 30 feet in length. It is available in light grey, beige, green and blue, so you certainly have options when it comes to colors, unlike the other covers in this review. Just like the previous two RV covers, this RV cover is made of three different layers of polypropylene, designed to protect the RV from UV rays, moist, snows, scratches, bird waste, debris and so on. This cover comes with a handy storage bag, so you can carry and store it in a nice, compact manner when not in use. There are elasticized hem corners that give this RV cover a smooth, feel-good fit. Air vents are also included to let out any moist air that may otherwise get trapped inside the cover and along the RV. This RV cover comes with a two-year warranty. You have plenty of time to take a look at this cover for any defects or errors, and if that is the case, you are free to have it turned in and get replaced. Zippered access panels are also present with this RV, allowing owners to re-enter the RV if need be. These access panels are incredibly convenient, and do not require you to remove the cover at all. This is a cheaply made RV cover, to be perfectly honest. It might last two years tops before it shows any signs of wear and tear. It isn’t necessarily the material that is failing, but how it has been woven, which causes it to end up failing faster than other covers of the same materials. This RV cover from ADCO is for significantly smaller RVs than the first RV cover. It have two different shades of gray for its appearance. This RV cover is made of polypropylene, which is a textured plastic. This material has three layers to ensure nothing penetrates the cover, such as rainwater. On the cover are air vents, designed to allow air to escape the cover, preventing the RV from fogging up and getting surface damage that way. Like the first RV cover, there too are zippered panels so that you can still enter and exit the RV when it is covered. There is no need to remove the cover at all if all you want to do is get inside it for whatever reason. The buckled cinching system is how the RV cover can fit around the RV without you having to crawl underneath the RV. This takes away a challenging step in getting in RV cover secure. This RV cover is available with a two-year warranty. While it isn’t a lifetime warranty, there is still plenty of time to check for any defects or errors. If you happen to notice anything wrong when it arrives, you can get it replaced for free. The warranty doesn’t cover water damage or penetration. This RV cover is not the most durable, and trust me when we say that most durable is what you should be looking for. We guess that this RV cover will last about two to four years, depending on the weather conditions. Despite it’s tri-layered design, it will still develop holes over time, which is unfortunate. Camco is known for making a plethora of RV products, but how do their RV covers pan out? This one in particular is for Class C RVs that are 28 to 30 feet long. This cover for RVs is made of tri-layered polypropylene fabric. According to Camco, this is a cover that is ideal for snowy and cold regions, where the RV could face problems when being exposed in cold climates. Like ADCO’s RV cover, there are air vents on the cover so that you can prevent fog or moisture from getting trapped inside, which would otherwise develop mold over time. Included with this cover is a storage bag. Simply tuck this cover inside this bag and you have a small and convenient place to store it when it is not in use. This RV cover comes with a one-year warranty. It may not be long, but any and all faulty parts or the cover itself will be replaced by Camco. This is ideal if you are looking to use the RV cover very soon, and rather not wait until a whole season or year before you just start to use and examine it. To easily wrap this cover around your RV, this cover has a self-adjusting strap system so the cover will find its own way in place. Really innovative. There are also zippered access panels so that you can enter and exit the RV if you need to. OF course, this means that you won’t have to take off the cover entirely if all you want to do is go back inside the RV for the reason you see fit. The achilles heel with this RV cover comes in the form if it’s stitching; specifically its seams. When these seams fail, you got multiple pieces of the RV cover, and you might not have the resources or talents to stitch them all back together. This is the second of two RV covers from Classic Accessories. This is a more affordable version of their first RV cover, and it fits RV from 27 to 30 feet in length. Like the previous three RV covers, this RV cover has three layers of polypropylene that is designed to repel debris, dirt, rain, sunrays, snow and other elements. This RV cover has elastic hem corners so that the cover wraps around the RV in place, and that it doesn’t come undone in any way. There are also air vents to prevent the RV’s siding from collecting moisture over time. Included is a canvas bag so that you can store this RV cover when not in use. You will have the cover in a carryable, compact state that you can leave in your RV or garage. There are zippered access panels to allow RV owners to access RV doors as well as engine panels. A must-have feature in any RV cover that raises its convenience factor. This RV cover comes with a solid three-year warranty. You have more than enough time to be sure that the RV cover you buy is 100 percent usable and in working condition. To say the least, this is not a long-lasting cover. It could take only a month or even a couple of storms for this cover to start tearing. Thankfully, you can get a free replacement and they will send over a new RV cover; failures during storms are covered with the warranty. However, you might still want a better cover, overall, just so you don’t have to go through hoops each time the cover fails. Of course, RV covers are not one size fits all products. To be sure that you are getting the right-sized cover for your RV or trailer, see each cover’s product description to determine the maximum height and length for the RV that the cover is designed for. Like a mattress cover, the RV cover should fit snugly throughout and should fit just like a glove. Before covering your RV, be sure that it is cleaned by removing any dust and dirt on the siding and roof that could otherwise cause abrasions. If there are any sharp edges or corners from your RV, it would be a good idea to pad them with styrofoam or another material so that they do not tear or cut the cover open. When covering the RV, we recommend you get some help in order to have it covered with no hassle. Cover your RV when you anticipate months of inactivity. Cover it especially during the winter so it will prevent snow from causing damage to your vehicle. During the camping season, it is also a good idea to cover it as you might be using it, as well. During hot nights, you can also cover the RV to keep heat from getting inside of it. Covering your RV is also a novel idea when you have a garage to park it in, as you will want to prevent mold from moisture from growing on it. Polyester is a RV cover fabric that is best suited for RVs in hot climates. If you live in or travel to states like Florida, Texas or Arizona. It would be wise to choose a polyester RV cover. Polypropylene is best for wet and rainy climates. While it does not stop water completely, it is designed to trap water in between its fibers and allow time to evaporate it into the air eventually. RV covers that are waterproof are known to have the best levels of protection. Waterproof means that the water will touch the cover, but slide right off of it. RV covers that aren’t water proof will absorb water in between the layers of the cover, in which the water is meant to evaporate over time. The best RV cover that you can buy today is none other than the Classic Accessories OverDrive PermaPRO Deluxe Travel Trailer Cover. This is the only RV cover in this review with ripstop fabric, but it is proven to work well against extreme weather and other environmental factors. On top of its professional quality, it does everything that you would like your RV cover to do, making it an attractive cover to get. The only downside is the size. It might be slightly larger than advertised, but as mentioned previously, we suggest to try the next size down if you want a precise, snug fit. The Overdrive PermaPro might be a pricy RV cover, but we all agree that it is definitely worth the money.